There are many positives to adoption. For many hopeful parents, it is the answer to years of hoping, waiting and struggling to build a family. For many women facing an unplanned pregnancy, it is a chance to give their child a life full of love and opportunity when they’re not ready to parent. But even when adoption is the right path for an expectant mother or prospective parent, it’s important not to overlook the challenges that come with adoption — including adoption-related depression. Anyone who gives birth or brings a new child home can experience postpartum or post-adoption depression. Whichever side of the adoption triad you are on, here’s what you should know about depression after adoption. Placing a child for adoption is one of the most emotionally challenging things a parent can do. During the adoption process and after placement, it is completely normal for birth mothers (and birth fathers) to experience feelings of grief and loss. And, just like any woman who gives birth, it is also possible to experience symptoms of postpartum depression. According to the National Institute of Mental Health, postpartum depression is a mood disorder that can affect women after childbirth. The disorder is often caused by a combination of physical and emotional factors, including changes in hormone levels after childbirth. Women may be at greater risk for postpartum depression if they or someone in their family has a history of mental health issues. Stress is another risk factor — and facing an unplanned pregnancy and making an adoption plan can definitely be stressful for any woman. If your feelings of depression become overwhelming, or if you have thoughts of harming yourself, seek help immediately. You can chat online or call the National Suicide Prevention Lifeline at any time, 24/7, at 1-800-273-TALK(8255). These symptoms can be intense and, if left untreated, can last for many months or longer. If you are a birth mother or a woman considering adoption, it’s important to recognize the differences between postpartum depression and the normal feelings of grief and loss that will likely accompany your adoption decision. 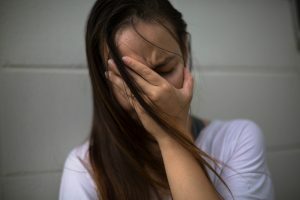 While a birth mother’s feelings of grief and loss may never disappear completely, there is treatment for postpartum depression, and symptoms of the disorder should fade over time. Work with your adoption counselor. Your adoption specialist is available 24/7 to provide the emotional support and counseling you need when you call 1-800-ADOPTION. Throughout your pregnancy, he or she can help you prepare for the feelings to expect at placement and can give you the tools and resources you need to cope after your baby is born. This support is always completely free to you as a woman considering adoption. Talk to your doctor. Your doctor may be able to screen you for signs of depression during your pregnancy and after your baby’s birth. He or she can also recommend and prescribe different courses of treatment for depression. Remember, if you are making an adoption plan, your medical costs will be covered throughout your pregnancy. Lean on your support system. Your adoption specialist can help you build an adoption support system of close friends and family members that you can count on. Confide in these trusted people, especially in the months following the adoption. You might also consider joining a birth parent support group for additional support. Live a healthy lifestyle. Eating right, exercising regularly, getting enough rest and abstaining from drugs, alcohol and other harmful substances can go a long way in treating postpartum depression and improving mental health overall. Choose an open adoption. Of course, open adoption isn’t always right for everyone, but it’s highly recommended that you maintain some level of contact with your child, if possible. Seeing your child grow up happy, healthy and loved through an open adoption may help reassure you if you’re feeling any doubt, guilt or shame for your adoption decision — which can, in turn, provide some relief from post-placement depression. After months or years of hoping and waiting, some adoptive parents are surprised to find themselves facing feelings of sadness and anxiety when they bring their new child home. But becoming a parent — often on short notice — can be stressful, and post-adoption depression is not uncommon in adoptive parents. In fact, research suggests that anywhere from 18–26 percent of new adoptive mothers deal with symptoms of depression. Like postpartum depression, post-adoption depression is likely caused by a combination of physical and emotional factors. Sleep deprivation and feeling overwhelmed are common culprits, and adoptive parents often also struggle with feelings of guilt or sadness for their child’s birth parents. Some adoptive parents may also feel like there is less support or understanding of their situation than there is for new biological parents. All of these factors and more can contribute to post-adoption depression. If you are concerned that you might harm yourself or your child, you should seek help immediately by dialing 911 or reaching out to the National Suicide Prevention Lifeline at 1-800-273-TALK(8255). While an adjustment period is to be expected for any new parents, any of the above symptoms that last for more than a few weeks may be a more serious sign of post-adoption depression. If that’s the case for you, you should talk to your doctor. Give it time. Many parents describe an immediate, strong sense of attachment to their child — but many do not. Not all parents bond with their new baby immediately, whether they are parents via biology or adoption. This does not make you a bad parent, and it doesn’t mean you don’t love and care for your new baby. Your bond with your child will continue to grow over time, and there are some tips for bonding with your baby that you might also try. Manage your expectations. The adoption process gives hopeful parents a lot of time to daydream about what they will be like as parents and what their child will be like when he or she comes home. However, it’s nearly impossible to live up to those dreams of being a “perfect parent.” Try to be realistic, and don’t beat yourself up if things don’t go exactly as you’d hoped. Build a support network. Lean on your friends and family members, and ask them for the same support they would offer to any new parents. You might also seek out and befriend other adoptive families or join an adoption support group. Live a healthy lifestyle. As difficult as it might be with a new baby, try to get as much rest as you can; lack of sleep can be a major contributing factor to post-adoption depression. Eat right, get moderate exercise and take steps to limit and relieve as much stress as you can. Seek help. If you experience symptoms of post-adoption depression, don’t be afraid to talk to your doctor, a therapist or your adoption specialist for professional help. Remember, feelings of postpartum or post-adoption depression are nothing to be ashamed of, and help is available to you. If you are struggling with post-placement depression, contact your doctor or call 1-800-ADOPTION to speak with an adoption specialist.